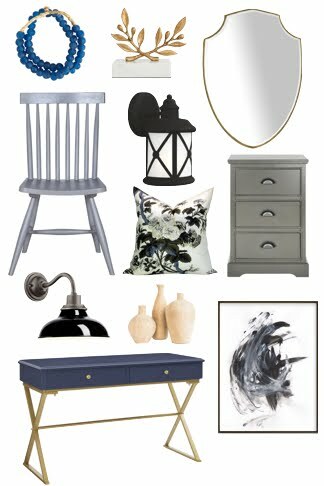 With the wainscoting up and the wallpaper down, our dining room has the equivalent of a pretty black dress on... now its time to add some jewellry! In the dining room, that translates into pattern, shine, and light. my beautiful mirrored cabinet into the corner. On top will sit the Tiffany crystal decanter and rock glasses we got as a gift from HandyMan's boss...so pretty! To make the room all sparkly and shiny, we've ordered this nifty little light fixture from Universal Lighting. 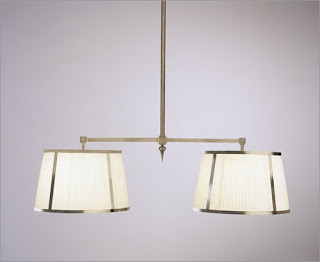 Its the Chase model double pendant by Robert Abbey. More typically used over a kitchen island, it'll do just as well over our oval dining table. Since the barrel shades are hung off a t-bar, the view from the living room through the back garden window won't be impeded. 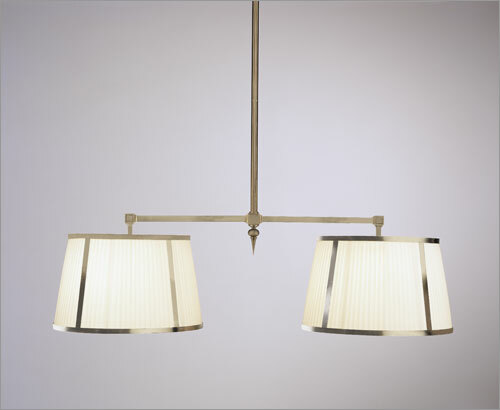 The light has a nice antique nickel finish, lending to the traditional air of the room. And what would a dining room be without a bit of "drama". For that, we've gone the wallpaper route. We wanted something bold, colourful, vibrant, and graphic. Finally, after months of looking (okay, not really ;) ), here's what we are going with... Tobago by Arte Wallpapers.